So you’ve decided to update your kitchen. That’s great! But now you have to figure out how you want to update it. We suggest you start with your countertop. A good countertop is integral to the practicality and beauty of your kitchen. It’s where you do food prep, dry dishes, and so much more. Two of the most popular high-end countertop options right now are granite and quartz, but for homeowners and designers looking for a stand-out look with all the benefits of rock, glass countertops may be a better choice. In a world that often chooses cold stone, glass kitchen countertops can breathe some airy lightness back into the home. As with all custom glass pieces, these countertops can come in any colour; they can be completely transparent or opaque (or somewhere in the middle); and they can be smooth to touch or embedded with texture. The aesthetic opportunities when designing a glass countertop are trueless endless. Lights can be installed beneath the glass for a backlit feel, the glass can be infused with any (or multiple) colours, and the counter top can come in any shape you imagine. For an elegant contemporary countertop that stands out among the rocks, there’s no better option than custom glass. 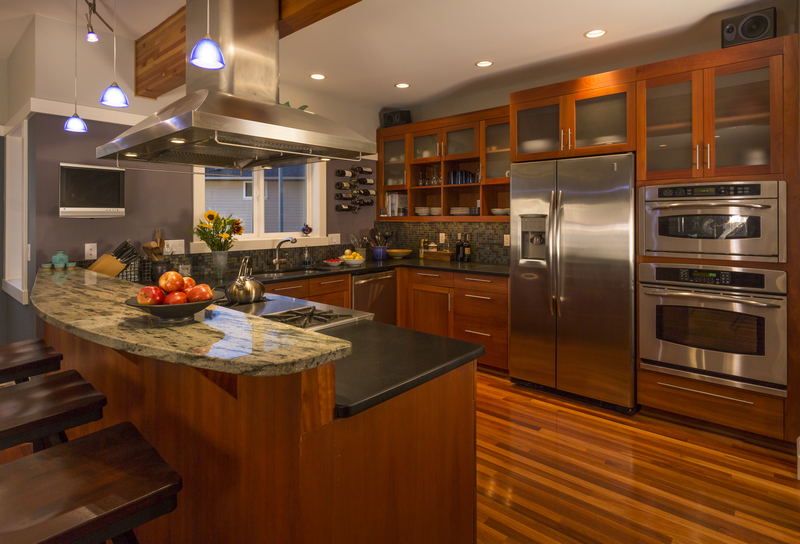 Glass countertops are recognized as the most environmentally sound option between granite, quartz, and glass. While granite needs to be mined and quartz is partially mined and partially engineered, glass countertops can be made entirely from recycled material. Better yet, if in 30 years, you decide you’d like to update your countertops again, the glass can be recycled instead of sent to the landfill. Perhaps the feature that most decisively separates luxury countertops from common ones is how practical the material is. In this regard, glass countertops are equal to rock ones. They’re non-porous to bacteria and fungi. They’re scratch resistant, completely waterproof, and heat resistant, so you can place hot pots directly onto the glass. Glass is actually more stain resistant than granite, and a little vinegar and water is all you need to keep them shining. If you’ve decided to update your countertops, you’ve come to the right place! Our designers can work with you to create a beautiful glass countertop that perfectly matches your aesthetic dream. Come into House of Mirrors and Glass today to see samples of our work and meet our experts.